Anne Bonny/Mary Read | Take Back Halloween! Pirates of the Caribbean! Real pirates, that is: Anne Bonny (1690s-?) and Mary Read (1690s-1721). They sailed the high seas with the infamous Calico Jack, and so much has been written about the three of them that we can’t possibly squeeze it in here. We need all the space just to talk about the costumes, since we’re doing both of them on this one page. Instead we’re going to direct you over to Forgotten Newsmakers for a biographical sketch. 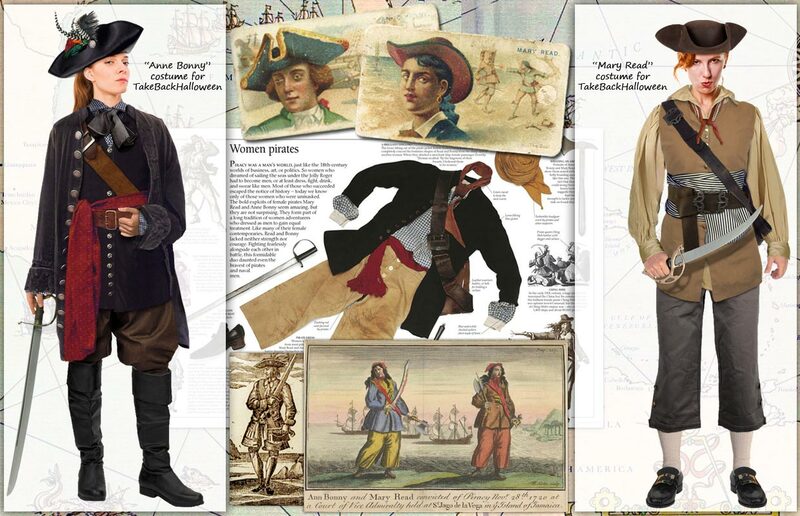 With the costumes, we’ve tried to split the difference between the fanciful Hollywood image of a pirate—long coat, cavalry boots—and the grimy reality of everyday pirate clothing in the early 18th century. Anne Bonny is dressed like a pirate on shore leave, parading around in a combination of stolen finery and sailor slops. She’s wearing a blue check workshirt—ubiquitous naval garb in the 18th century—but she’s topped it off with a rather fancier black silk cravat. Her stolen black velvet coat is a bit too big for her, as is the matching velvet waistcoat. Her pants are rough brown trousers, stuffed into tall black boots that once graced the legs of a Spanish grandee. On her head she wears a leather tricorn spruced up with feathers and a silver button. A calico sash, a belt, and a baldric complete the picture. 1. Shirt and tie: Authentic 18th century blue check cotton workshirt with a black silk cravat. 2. Coat and waistcoat: Captain De Lisle black velvet coat with the Captain De Lisle black velvet vest. If the buttons are a little too new-looking, you can tone them down with Rub-N-Buff. 3. Pants: Brown drawstring pants . These are one-size-fits-all men’s pants with drawstrings at the waist and ankles, so you can adjust them for various looks. 4. 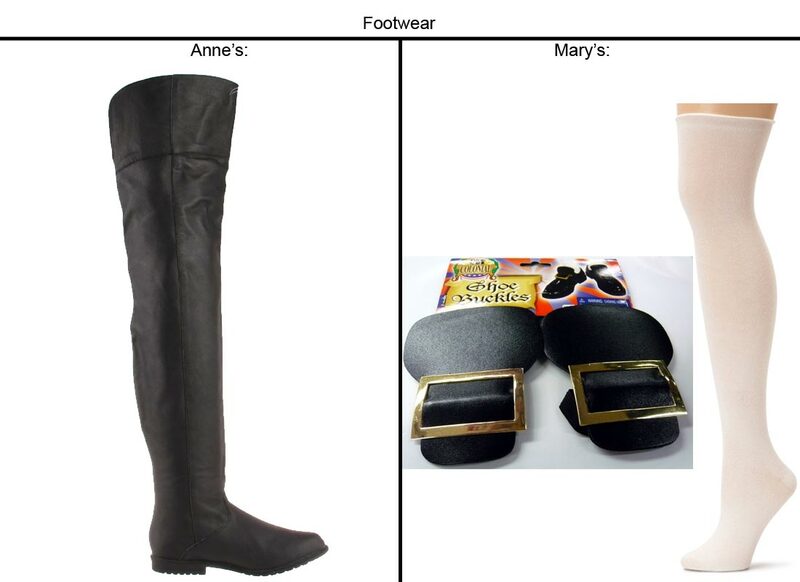 Footwear: Over-the-knee boots , worn with the top folded down. Tall boots like this were designed for cavalry, and pace Johnny Depp, they’re not the sort of thing a pirate would normally wear. But this is a special occasion. 5. Headgear: Leather tricorn hat decorated with feathers. It’s expensive because it’s a real hat. Use thread to tie the feathers and a spare silver button to the cross-stitched “X” on the side of the hat. 6. Sash: You don’t need to buy a pre-made sash. Just get a length of crimson paisley print fabric (108 inches wide) and wrap it around your waist. Ragged edges are good. Sword: Pirates of the Caribbean Sword . Belt and baldric: The baldric is the cross belt worn over one shoulder, designed to hold a sword or pistol. You can buy new baldrics and belts, or just use some old belts from your closet. If you don’t need a fancy baldric with a fitted weapon holder, just sling a long belt over your shoulder and cinch it under your coat, the way Anne has done here. 1. Shirt and tie: Cotton shirt in natural with a dark red bandana . 2. Coat and waistcoat: No coat. The waistcoat is the Ansell 1720 Vest in aged brown . 3. 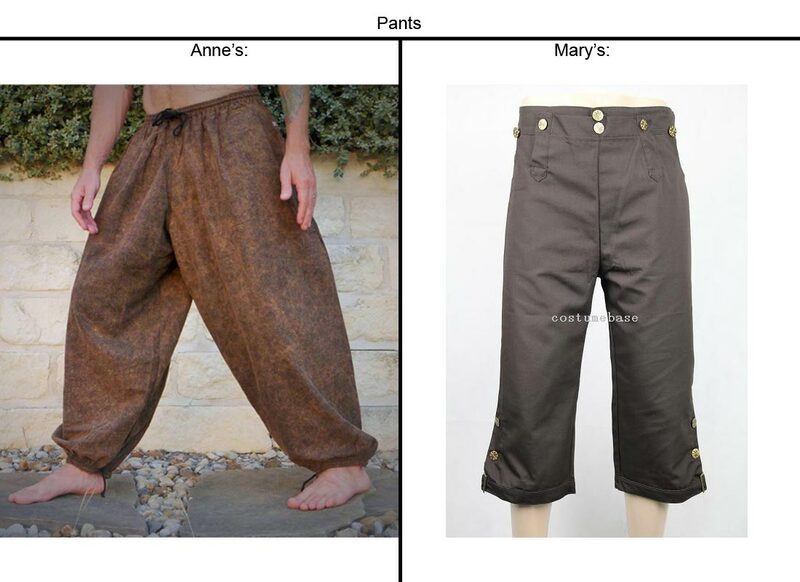 Pants: Knee breeches in brown . What this seller calls brown looks more like a dark taupe really. 4. Footwear: Shoe buckles . These are just the buckles, not the shoes. They’re a cheap but simple way to transform an existing pair of black shoes into something that looks more 18th centuryish. Wear white over-the-knee socks to simulate the look of knitted stockings. 5. Headgear: Brown tricorn hat . This is just a costume hat, but it’s not bad looking. 6. 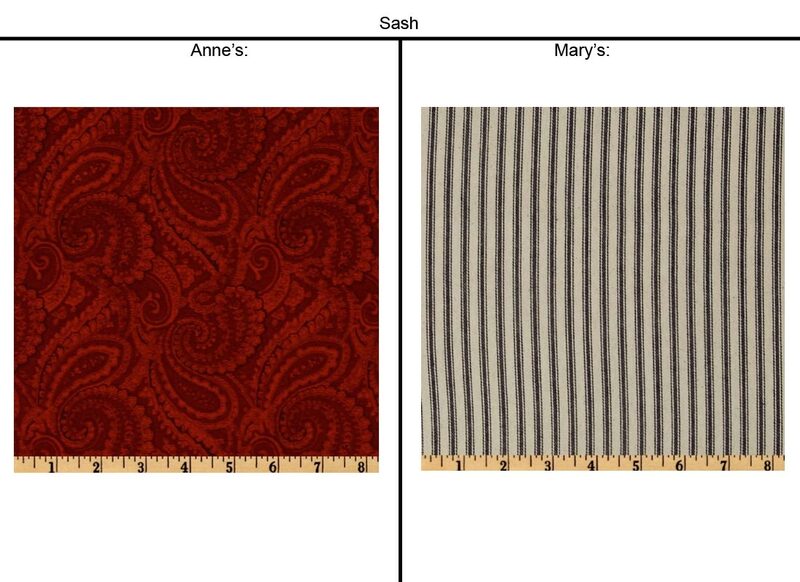 Sash: Striped ticking was a common fabric on seagoing vessels in the 18th century. Get a couple of yards of ticking stripe fabric and wrap it around your waist. Tuck in the loose ends for a practical look. Belt and baldric: Mary is wearing the baldric and one of the belts from this Jack Sparrow replica set . 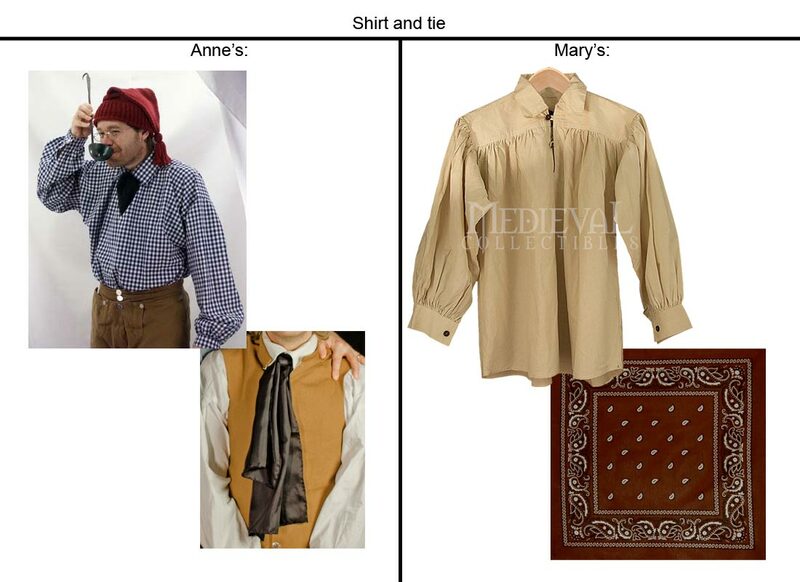 (The baldric is the cross piece worn over one shoulder.) 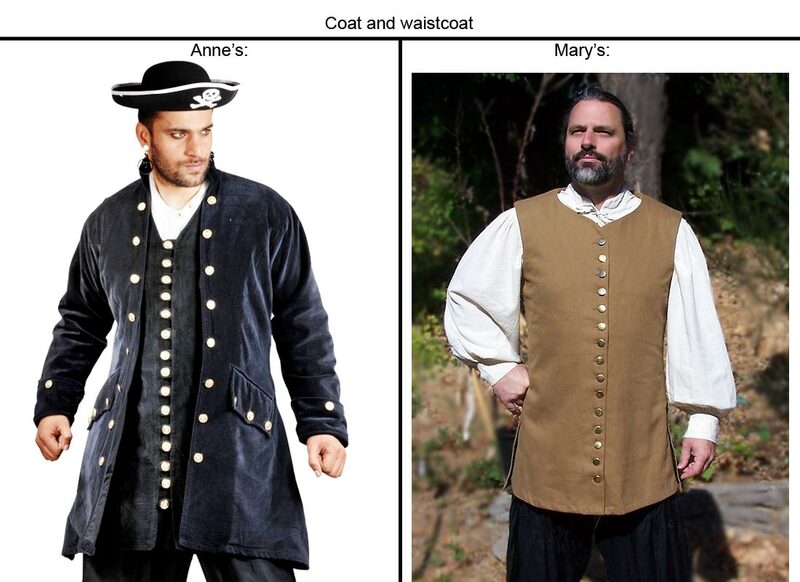 You can also shop for baldrics and belts from the reenactment people, or just use some old belts from your closet. Related posts: Last-minute Mary Read (or Anne Bonny) and Pirates of the Caribbean (for real): Anne Bonny and Mary Read. Illustration credits: The center of our main illustration is a two-page layout from DK Eyewitness Pirate, a wonderful book that we thoroughly recommend. The two woodcut illustrations at the bottom are from A General History of the Robberies and Murders of the Most Notorious Pyrates, originally published in 1724. That’s the earliest known depiction of Anne Bonny and Mary Read (color added later); the sepia-toned gentleman to their left is Calico Jack. The two trading cards at the top are from “Pirates of the Spanish Main,” an 1888 trading card set issued by Allen & Ginter. 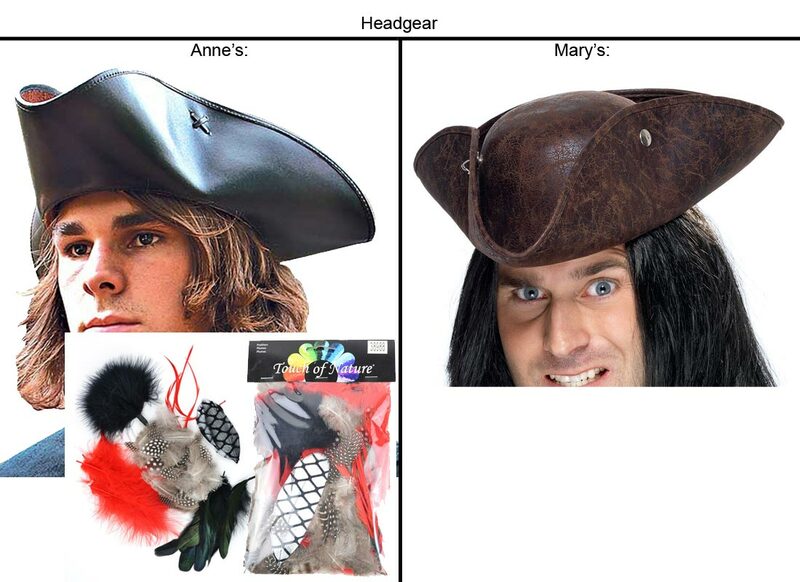 Anne Bonny’s card is on the left and Mary Read’s is on the right.